The project is located in a small resort town on a two-lane scenic highway which also provides a vital north-south link within the state for both commercial and tourist traffic. Any prolonged traffic interruptions on this highway would have significant impact as there is no practical detour available. The existing 65 year old three-span steel girder bridge crossing a 20 ft deep river was classified as structurally and functionally deficient and originally scheduled to be replaced in 2017. However, latest underwater inspections revealed that the exposed slender steel H-piles supporting existing piers in the deep river were excessively corroded (up to 50% of section loss) and could no longer support heavy truck loads, causing truck load restrictions along the route and impeding commercial traffic. The state DOT temporarily addressed the issue by encapsulating 50% of the corroded piles with epoxy filled jackets, which allowed for a partial lift in traffic restrictions, but in order to assure long-term safety and full mobility, the bridge design and its replacement had to be accelerated and performed as soon as possible. It was also determined that in order to minimize impact on traveling public, commercial traffic and local businesses, the entire structure had to be erected by ABC methods with precast concrete elements for all bridge components, delivered to the site and rapidly assembled in the field. The bridge removal and replacement was to be done in two stages while maintaining two-way traffic through the construction site at all time, which required a permanent shift of the roadway alignment. This alignment shift and the right-of-way limitations called for construction of long MSE retaining walls at each end of the new bridge. The MSE walls with precast panel facing were also used instead of conventional wings at each abutment. Other challenges included limited access within a deep river available only on one side of the existing bridge and the low hanging electrical power lines. The solution was to construct Stage 1 of the new bridge using temporary work platform erected within the river while during Stage 2 the access was possible by utilizing the remainder of the existing bridge. The Stage 2 pier piles of the new bridge were actually installed through the openings cut in the existing deck and the pile spacing was arranged to fit between existing bridge girders. The pile installation within the river was further complicated by large boulders and therefore required pre-drilling with the use of temporary casing. Use of the vulnerable existing bridge as a work platform supporting heavy equipment was questionable, however determined possible by careful analysis, equipment placement restrictions, and prior strengthening of the corroded piles, as mentioned above. Of particular interest was an innovative method of pier wall installation within the deep river and without the use of cofferdam. Steel shell piles were driven through water into the riverbed and cut off just above the water line. Precast pier segments were positioned directly on top of the piles in such a way that the piles are completely hidden from view above the water, enhancing aesthetics. Due to its location next to the recreational resort and within the natural beautiful surroundings, the new structure had to be aesthetically pleasing while blending with the environment. This was achieved by texturizing and staining of the concrete facing used on the precast pier wall segments, MSE wall panels and concrete parapets. 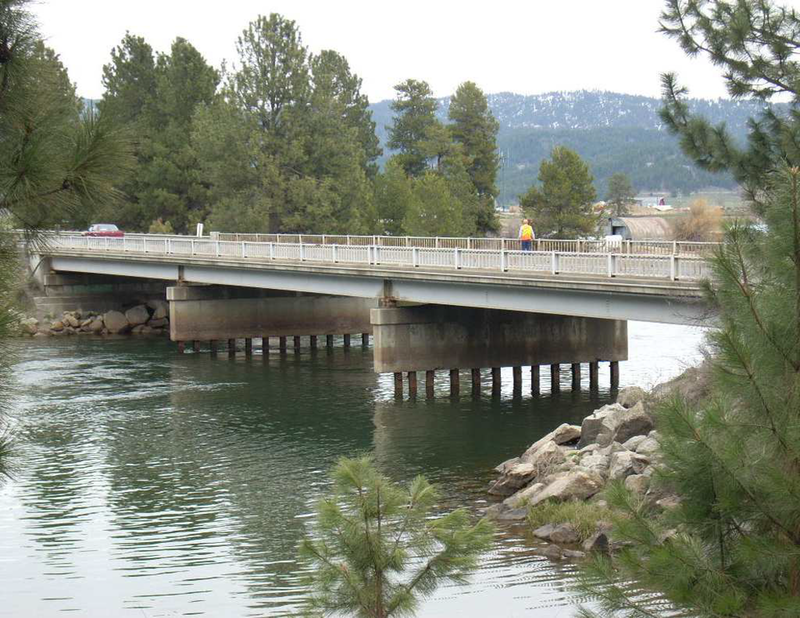 Public meetings were held to inform the locals on the proposed bridge replacement. Coordination with the local utility company was also required in order to relocate utility lines from the existing bridge onto the new structure. Environmental concerns, associated with the work within the river, the construction noise issues and seasonal high river flows had to be considered as well. (16) 124’-3” long, Deck Bulb-T girders with variable depth of 5.58’ at mid-span and 5.81’ at supports and variable top flange thickness of 8” at mid-span and 10.75” at supports. (4) abutment pile caps, two for each construction stage, connected with closure pours between stages. Each pile cap is 26’-3” long, 3’-9” wide, with variable depth between 3.77’ and 4.30’. (4) pier wall hollow segments, one lower and one upper segment was used to construct a separate wall at each stage. All segments are 26.23’ long and 5.0’ wide. Lower segments are 6.5’ deep and upper segment’s depth vary between 5.76’ and 6.29’. All precast elements, except girders, weigh less than 30 Ton to ease shipment and handling. Traffic handling: Two lanes of traffic opened during construction with minor (up to 15 minutes) interruptions during each girder erection. 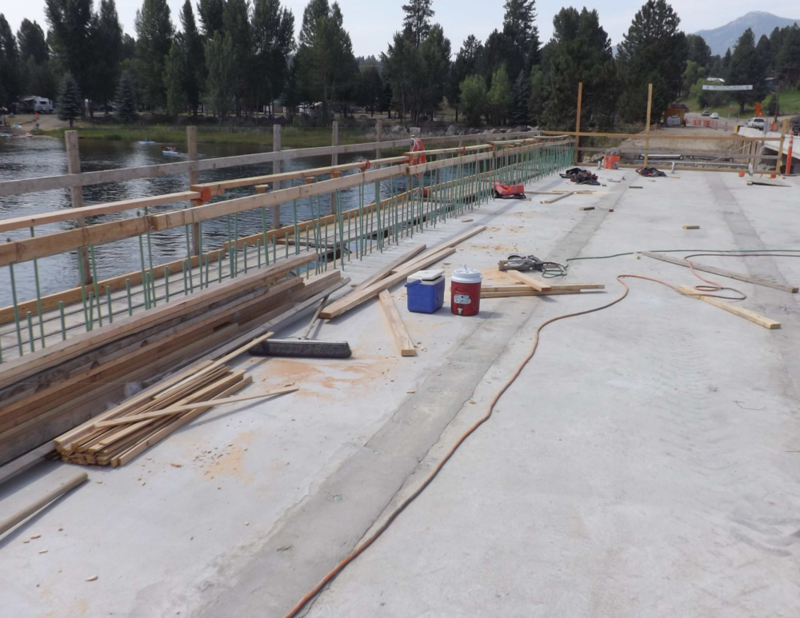 All elements of the superstructure and substructure of the new bridge, except sidewalks and parapets, consist of prefabricated precast concrete components allowing quick assembly in the field in order to meet tight project schedule. Using precast concrete elements allowed implementation of ABC methods and in turn reduced inconvenience to the public, reduced economic and environmental impact, improved safety during construction and provided high quality, durable, low maintenance and aesthetically pleasing bridge structure. The precast abutment pile caps are supported on a single row of steel H-piles. The piles are protruding into the CMP block-outs within the caps and concreted in-place using high early strength concrete with fibers. 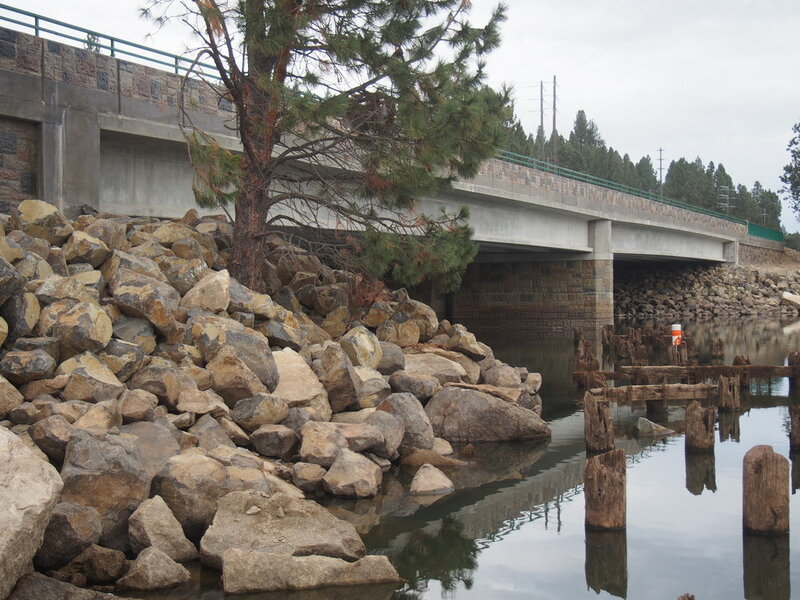 Precast pier segments rest on top of 30” diameter single row shell piles driven into the riverbed, cut off at the exact elevation just above the waterline and filled with concrete. 14” diameter centering pipes cast-in at the top of shell piles are used to align and to secure lower segments of the pier wall on top of the shell piles. Lower segments contain top protruding pipes with threaded adjustment bolts around the perimeter, which slide over centering pipes in a similar fashion to a Christmas tree stand. This system also allows the submerged lower segment to maintain its position in a flowing river pushing against it during and after erection. After assuring the lower segment is in the exact as designed position, it is then secured permanently by placing grout between protruding and centering pipes. Lower pier wall segments are shaped as inverted tubs (or skirts) and are covering shell piles below the waterline, making them invisible for aesthetic reasons. 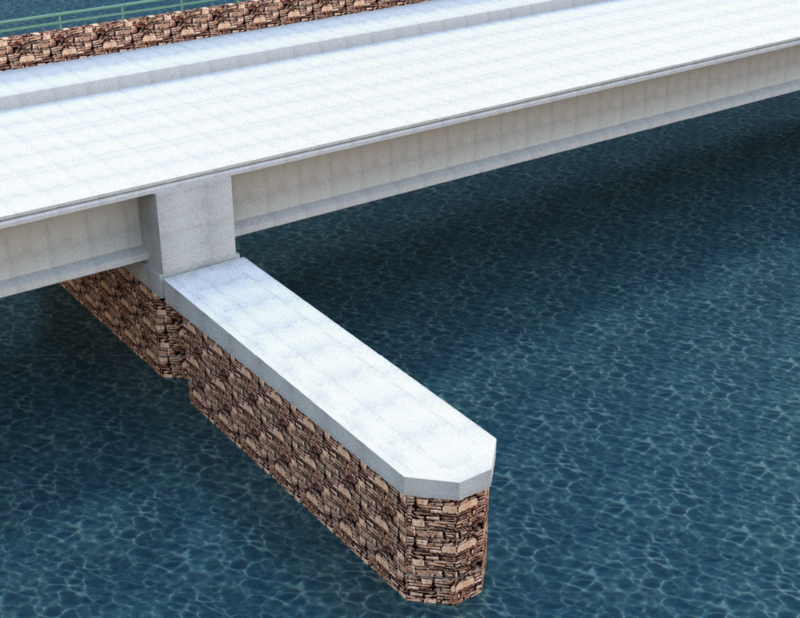 Upper hollow pier segments are connected to the lower segments with continuous vertical reinforcing bars inserted through embedded metal sleeves and grouted in place. Hollow voids in the upper segments are then filled with high early strength concrete with fibers creating a solid wall. Separate pier wall was constructed at each stage without connecting the walls between stages. However, each stage of the bridge is connected at the pier and abutment diaphragms. 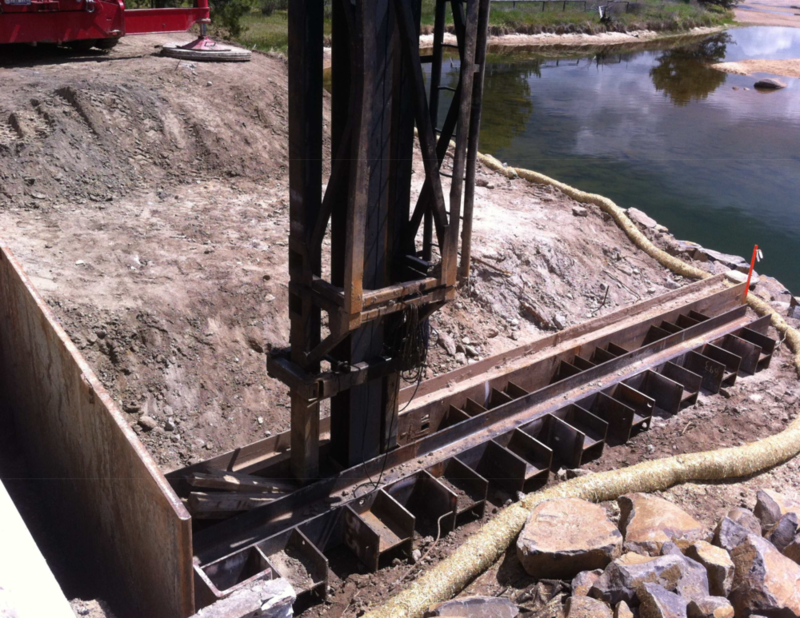 This innovative method of pier construction eliminated the need of deep cofferdams or forms within the river, significantly reducing cost and construction time and providing the appearance of a solid wall while hiding potentially unsightly steel shell piles. 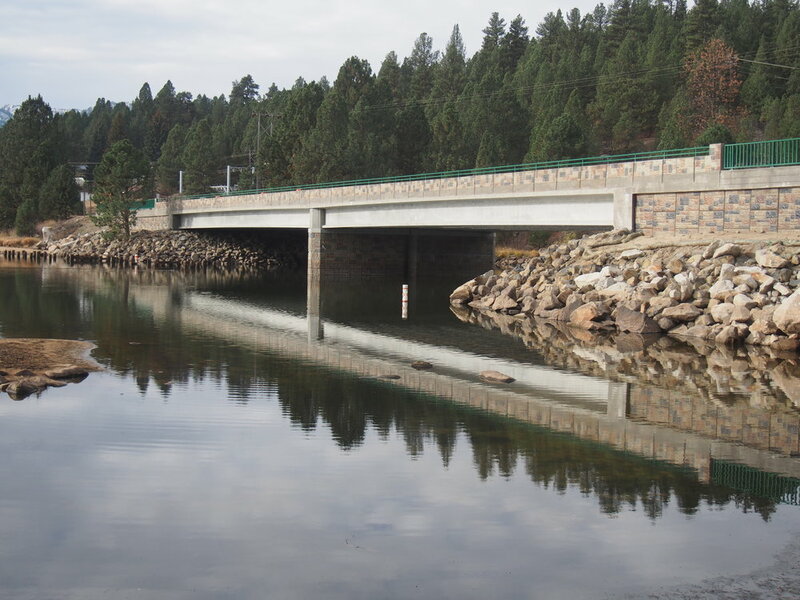 The precast 124’-3” long Deck Bulb-T girders were quickly erected on top of the precast substructure elements and the top flanges connected by 10” wide closure pours filled with high strength, fast curing, fiber- reinforced repair mortar instead of significantly more expansive UHPC. Two layers of top flange transverse girder reinforcement are protruding 9” into the closure pours with headed rebar terminators in the bottom layer, as to enhance rebar development. This proved to provide strong and effective connection. By using this innovative approach, the finished deck surface matches the behavior, appearance and durability of the cast-in-place deck, while eliminating time consuming conventional deck installation. Negative girder connection at the pier was achieved by extending top flange longitudinal reinforcement into the pier diaphragm and splicing it with the reinforcement of the girder in adjacent span using mechanical couplers. Developing bottom flange strands into the pier diaphragm provided positive girder connection. The girders were next framed at the pier and abutments by forming integral diaphragms filled with high early strength concrete with fibers. Integral abutment and pier diaphragms increase structural redundancy and eliminate exposed bearings and expansion joints, reducing future maintenance requirements. After placement of approach slabs, sidewalks and parapets, the driving surface was covered with spray applied waterproofing membrane and AC overlay. (Top flanges of the deck girders were cast with variable thickness in order to offset the upward camber deflections and allowing constant depth of AC overlay, simplifying its placement.) This approach also provides smooth driving surface and well protected long lasting deck while simplifying future maintenance requirements. The weight of all precast elements, except girders, was kept under 30 Tons in order to ease transportation and handling and to reduce cost. Fast curing, high strength mortar and concrete with fibers were used in all connections as to minimize curing times and to reduce shrinkage cracks. The successful and timely completion of this challenging project was only possible with the use of precast concrete elements. Using simple and practical details with allowance of tolerance and field adjustments along with innovative construction procedure enabled the crew with limited experience in ABC methods to assemble the bridge structure on schedule and within budget. The bridge was entirely constructed of precast components. Several innovations were implemented, not previously used in our state. The superstructure consists of Deck Bulb-T girders with cast-in-place 10” wide closure pours between top flanges. This allows for quick superstructure erection without time consuming and potentially problematic deck placement (conventional or precast). Previously, Deck Bulb-T girders in our state were connected at the top flanges using welded tabs and grouted keyways. This connection proved sometimes problematic due to development of longitudinal cracks along the keyways and subsequent seepage of water and deicing chemicals through the cracks. Using closure pours instead, provides much more robust connection and more durable deck, which performs more like a conventional cast-in-place deck. Similar connections have been developed in other states with the use of very expensive UHPC. 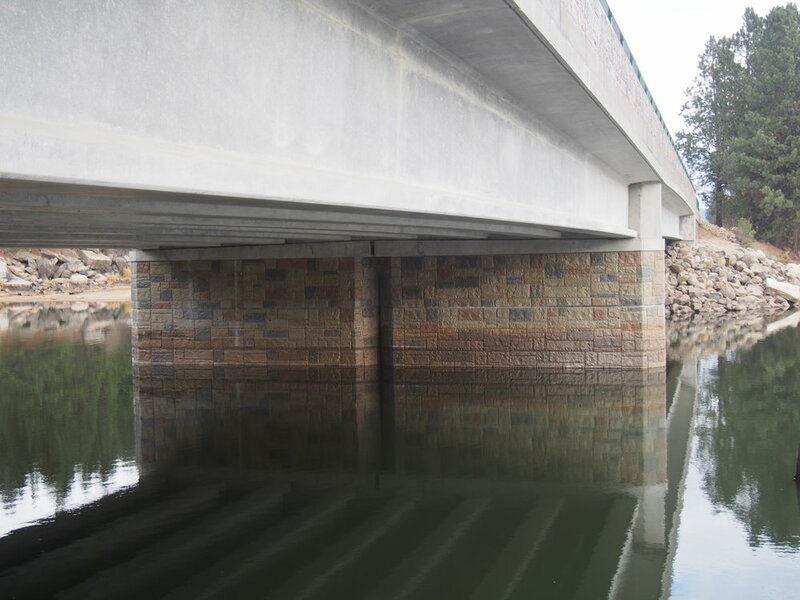 However, in order to reduce costs and to avoid potential issues with demanding quality controls associated with UHPC placement, our bridge incorporated (with good results) widely available, fast curing, high strength, fiber reinforced repair mortar in these connections. Both layers of top flange transverse reinforcement protrude 9” into the closure pour with headed rebar terminators in the bottom layer to enhance rebar development. Transverse reinforcement in adjacent girder flanges is staggered allowing girder erection without rebar interference in the closure pour area. In order to achieve superstructure continuity at the pier, the top flange longitudinal reinforcement was extended into the pier diaphragm and connected with the adjacent span girder reinforcement using mechanical couplers. Positive moment connection at the pier was achieved by developing bottom flange strands into the pier diaphragm. Integral connections between superstructure and substructure elements was provided by extending vertical reinforcement from precast abutment and pier segments into the abutment and pier diaphragms. Integral connections provide higher redundancy, improve seismic performance, reduce future maintenance and enhance aesthetics by eliminating visible joints and bearings. High early strength concrete with fibers was used in pier and abutment diaphragms in order to reduce required curing time. Developed innovative pier erection system within the deep river without the use of cofferdam. Single row of pier shell piles was driven into the river bed through 20’ deep water at each construction stage using templates in order to maintain pile alignment within +/-5” tolerance. The piles were cut off at the exact elevation just about the water level and filled with concrete. Smaller centering pipes are cast-in at the top of shell piles making sure their exact alignment and spacing is as required by design. Lower, inverted tub precast pier segments are then positioned on top of the shell piles. The segments contain protruding pipes which slide over the centering pipes. Bolts threaded around the protruding pipes are used to align precisely of the lower segments, in a similar fashion to a Christmas tree stand. This system also allows the submerged lower segment to maintain its position in a flowing river pushing against it. After alignment of the lower segment is complete, the grout is placed between the protruding and the centering pipes to form a solid connection. The lower pier segment (skirt) is submerged deep enough as to hide the steel shell piles making them invisible above the water surface. Vent holes around the lower segment are provided for equalization of air pressure inside the tub due to fluctuating water level. Hollow upper pier segments are set on top of the lower segments and filled with high early strength concrete with fibers creating a solid wall. Continuity between lower and upper segments is provided by vertical reinforcement inserted through metal ducts around perimeter of the upper segment and grouted in place inside the ducts. In order to provide smooth driving surface, to protect the deck against de-icing chemicals and to simplify future deck maintenance, the surface of the deck was covered with spray-applied elastomer waterproofing membrane and the double layer of AC overlay. Top flanges of the deck girders were cast with variable thickness in order to offset the upward camber deflections, which allowed constant depth of AC overlay, simplifying its placement. MSE walls with precast panel facing were used instead of conventional retaining walls and wings behind abutments. This allowed for faster construction while enhancing aesthetics.